Enhance your sightseeing experience of Lisbon on a 3-hour cycling tour of Portugal’s capital city. 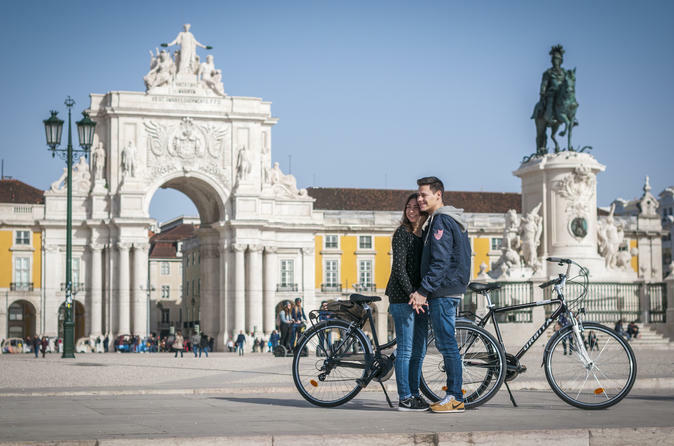 Following a gentle cycle route, you’ll visit historical highlights such as Marquês de Pombal square and pedal beside the picturesque Tagus River. See, too, the monumental Terreiro do Paço square and visit the Tower of Belém — an elaborate structure considered Lisbon’s symbol. Throughout the cycle, you’ll stop intermittently to capture photographs and listen to history rich commentary from your guide. Greet your guide and group at the Marquês de Pombal bus park and receive a short safety briefing. After donning your helmet and climbing onto your bicycle, you’ll cycle around Marquês de Pombal roundabout. Follow your guide along one of Lisbon’s most fashionable shopping avenues and explore the ambient streets of downtown. On arrival at the Tagus River, follow a picturesque route from Terreiro do Paço until you reach Belém, a historic district famed for its landmarks and exquisite custard tarts. Stop to learn about Belém Tower’s history and cultural significance before passing beneath a river bridge and returning to your original departure point.